Dallas "stonegaze" trio takes a small but crucial step forward and makes one of the best records of the year. "I was ruined at a tender, adolescent age by the phrase “stoned-lava flow”, as applied by a reviewer in a magazine to the guitars on Teenage Fanclub’s “Fear of Flying” (the review appears to have vanished from the internet; apologies to the involuntarily anonymous writer). That phrase -- the idea of that phrase -- seized me so strongly and was only partially fulfilled by that (admittedly great) song that it's been echoing through my reactions to songs since and was most recently and sharply triggered by True Widow's "Fourth Teeth" and, subsequently, the rest of the Dallas trio's third album, Circumambulation. There are few minor joys afforded to the longtime music fan as sweetly pleasurable as unexpectedly stumbling onto the perfect articulation of something you've been half-unconsciously searching for most of your life; if I could wrap the guitars on this album around me like a blanket, I would. The band has called their music "stonegaze", which seems as good a descriptor as any for its, well, stoned-lava flow guitars and densely melodic songs. 2011's awesomely titled As High As the Highest Heavens and From the Center to the Circumference of the Earth was a great record in its own right, but Circumambulation seems like a small but crucial step forward. 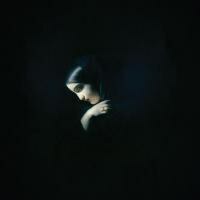 The composition, production, and performances are all still top-notch; but, perversely enough, what seems to have pushed True Widow from an excellent band to one making one of the year's best records is a slight increase in tempo. Just as the best way to make something seem actually random is to have it be… not actually random (see anything from random number generators to abstract expressionist art), the best way for True Widow to seem just crushingly dense, heavy, and slow-moving is actually to have the band vary its sturdy tempos a little more, have its fine rhythm section lock into the groove and underpin that sprawling guitar. "Slow-moving" might seem like a pejorative to anyone not versed in stoner rock, doom metal, shoegaze, or drone music, but here it never makes the songs seem less than sumptuous, like True Widow is spending as long as possible hitting the sweet spot. The aforementioned "Fourth Teeth", one of the songs that features vocals from bassist Nicole Estill, is a perfect example of that. Initial impressions of the songs are likely to focus on Estill's vocals, the great chorus (where she's backed by guitarist/main vocalist D.H. Phillips) and Phillips' rumbling, tuneful guitar line. All of those elements are crucial, but if you start digging into the song, Estill's bass and Timothy Starks's drumming are just as important, and in fact give the weight and shade and direction to the rest of the music that lets first listens linger on the guitar and vocals so strongly. Or on "Numb Hand", where the bridge basically consists of Phillips (awesomely) trying to gouge a hole with the same little riff over and over, and it's the rest of the band that makes that thrilling rather than tedious. The band's musical interplay really comes into focus on the instrumental "I:M:O", a slowly spiraling track that seems like it could, and should, go on for 20 minutes. And there's that sumptuousness again, burning like a lava flow, rich like dark chocolate, rolling like a steamroller. Circumambulation begins with the foreboding (and aptly titled) "Creeper" and ends with the gently decaying despair of "Lungr", and between and among them there is all the dark momentum, late-night bad vibes, and sullen melodies you could want. Many of the best records manage the trick of making the listener feel like they are hearing nothing less than a satisfyingly total and complete sound-world, that for its length no other music could or need exist. The stoned-lava flows and driving inertia of Circumambulation make that trick seem like the easiest one in the world.